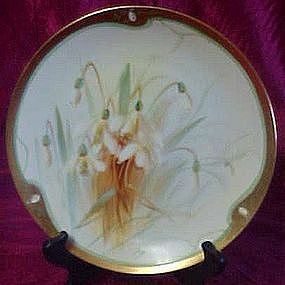 Beautiful Hand painted cabinet plate circa 1893-1910 signed by the artist (cant read the signature). Measures 8 1/2" in diameter and the flowers look like snowdrops, maybe some other kind of flower. Soft pastel colors of yellows white and green with a nice gold border. Completely hand painted and damage free. Stamped Rosenthal Bavaria and has the MA Pickard studios stamp also. Pickard China was established in Edgerton, Wisconsin in 1893 by Wilder Austin Pickard, and moved to Chicago in 1897. For some forty years the Pickard China Studio, as the firm was then known, was a decorating company specializing in hand painted art pieces, dessert and tea sets. Many of the original artists were from the Art Institute of Chicago. The staff was increased by renowned ceramic artists from all the countries of Europe. Since most of the china was manufactured abroad at the time, the Pickard studios imported blank ware to be decorated. These early pieces are now sought after by collectors.